I was happy to see Billy Miller of Norton Records represented. 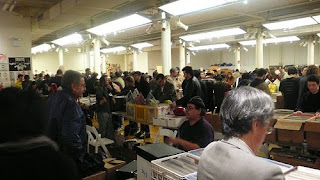 His table at this years WFMU Record Fair was as busy and bountiful as ever. By the way, if yo have never been to the WFMU Record Fair, it is a pilgrimage. It was described to me by a first timer this year as "overwhelming". I am proud to have supported it and watched it grow from the Elks Lodge in Hoboken, to a crowded church basement, all the way to the cavernous space it now occupies. This is a shot of one side of the room. The scale of this yearly event is impressive and daunting. Thank you for posting. I can count the things I miss about living up there on one hand and the WFMU fair would be one of the them.